The Feminine Pulse – Page 2 – Women contemplating life, art, and comic books. When the final buzzer sounds, the hands are shook, and our sons take their final salute off the ice, our six-months journey together comes to a close. Those first practices were wrought with uncertainty as we waded through tides of a seven- year-old’s self doubt, the murky waters of complete commitment, and the arduous prospect of fundraising. Those September days were spent with children stumbling on the ice and parents hesitantly hovering awkwardly at arms length of each other. As the season progressed so too did the team, and the seeds of family were sown. Our sons embodied the numbers on their backs, the wings on their helmets, and the colours of their jerseys. We watched, as one by one, their names changed and their identity strengthened. Loyalty transitioned from a vague concept to a way of life. Slowly they grew from boys who would lean on the shoulders of their parents, relying on them to tie skates, fasten knee pads, and clasp helmets, to young men, self sufficient and basking in the profound pleasure of a parent-free dressing room. As they matured together, the parents bonded. Each taking the other’s child under their wing; an unlimited supply of high-fives and roaring cheers of encouragement. I have never known a community of parents, who otherwise would never have met, to extend so much love, so much interest in the lives of a stranger’s child. Coaches who gave each young player the courage to see the world from the eyes of a team; the courage to hustle through assuredness and self-doubt; awakening the responsibility and reward of promise and sportsmanship, and teaching that teamwork, passing, and being dependable are worth more than all the goals in the world. Coaches who brought kids out of their shells; who played and joked and held them upside down in garbage cans ; who brought them on road trips; and who took the lonely kids under their wings when strong male bonds were needed or briefly absent. Our manager, our matriarch, held us together,ensured our bond, and breathed life and cultivated a family out of a motley of newcomers. How do you repay someone who believes unconditionally in the potential of hockey in the lives of children? Our player’s siblings. The younger ones, at the rink every early morning and late night. Sometimes cheerful, sometimes engaged, sometimes cantankerous and finished altogether with hockey, but always in awe of their brothers. The older one’s, sacrificing free Saturday mornings to teach our children how to shoot pucks and circle pylons. Demonstrating the stride and dexterity of a (slightly) more seasoned hockey player. Inspiring, confidence bearing, exceptional young men. Role models we, as parents, are proud to see our younger sons aspire to. We have shared in so much life in six short months. Winning streaks; hard losses; a new man; one man less; a knee injury that was felt compassionately by each player; a hotel stay that will be etched in our collective memories always; an uncontrollable fever that took one man away from the weekend of his year; first goals; hard hats; bottle drives; theatre productions; play dates; road hockey until dark; university idols; Fans of the Game; fierce friendships; brotherhood. Tomorrow our family says goodbye. Hockey sticks will be traded in for ball gloves and shin pads. We will move independently to the summer family awaiting us on baseball diamonds and soccer fields. When September returns some of us will mix in with new players, some of us will move up, some of us will move away. But I think, no matter where we tread, this first season, this first family, will be a beacon. One lighting our way, always in our hearts, and set as a precedent for what awaits us in the rinks to come. We will always be able to aspire greatness for our sons’ hockey experience on and off the ice, not only in terms of skill, but in terms of maturity and growth as individuals; as young men. In our little group, while not every boy dreams of greatness, each is a Great One in his own right, and this is a direct result of the family he has been raised in this last half a year. Thank you, dear Hockey family. I am honoured that my son skated alongside your sons. I am proud to have cheered with you and stood along the boards with you. I am not, particularly, a hockey fan, but I love Roch Carrier’s book, The Hockey Sweater. I read this picture book as a child and then again a number of times as an adult. I am neither a boy (like our protagonist) or a hockey fan, but I understand and appreciate the deeply rooted struggles between the French and the English people of Canada. At the heart of this book, the story is driven less by the mix up of a hockey sweater from Eaton’s, and I would even argue hockey, as it is with identity and overwhelming cultural oppression. The constant presence of the Catholic church in the background is a poignant depiction of the power of religion in the shaping of a regional and national identity. From the offset we see the Church looming over the skating rink as a place of acceptance. The angel statue is holding her arms open in welcome. The curator of the church is the ref, so religion and pastime is inextricably linked. All the children are dressed the same and the herd mentality is prevalent. When the boy gets his new parcel from the post office there is a large poster behind him that depicts the Poste Royale with the duelling French and English symbols. A little foreshadowing. When our protagonist is ostracized for wearing a Leaf’s jersey (the dominant and over bearing English cultural that represses the French) he is seen as a traitor, I would argue on a much larger scale than only that of hockey fanatics. He is a traitor to his culture. Can you be truly French if you wear a Leaf’s jersey? Are you a traitor to the small French community by succumbing to the lifestyle or aesthetics of the greater English community? I find the story terribly sad. The penultimate image of the boy walking to the church leaves the angel statue out. It is far less welcoming a place than before now that the young boy’s allegiance is in question. The final painting of the protagonist hanging his head low, alone in the church, up on the balcony, is a poignant remark on personal conflict and shame. He has become an outcast. How does one stay pure to their culture when it is so often infringed upon by another? This is a contemporary, pop-cultural, relevant and amusing way to depict a long and arduous conflict between the French and English speaking members of our country. I love teaching it in my history classes. When you get past the hockey (if you are inclined to do so) and see it as a smokescreen there is so much happening! This is a wonderful graphic novel that I have often seen on the shelves of my local library, but until recently I had no inclination to pick up. But in the end, I am so pleased that I did. Jane, The Fox and Me, by Fanny Britt and Isabelle Arsenault, is a beautiful book that should be read by a broad audience of youth and adults alike, lovers of literature and metaphor, lovers of art, and lovers of introspective fiction. It is a tale of a young girl, Helen, who struggles to accept herself as she is and to fit in to an often cruel and isolating world; is as ordinary as the tools with which she was drawn, pen and ink, colourless and fine. Finding comfort in the pages of Jane Eyre, young Helen begins to see herself as promising a person as the often overlooked Jane herself. The illustrations are stunning, I was particularly enamoured with those of the tired mother seeing to all the chores and responsibilities for her children, when late at night, as they sleep, she is mending hems. A subtle and poignant reminder of the burden and love of parenthood. There were two lovely contrasts that I cannot go unnoticed. The first, the mirroring of Helene’s life with that of Jane Eyre’s. Jane is a character who overcomes many odds, not least that of being perceived as exceptionally plain and an outcast, but is one who ultimately lives a life of happiness, and I think that is what Helene is looking for. The subtleties of color and shading let the reader understand Helen’s moods and circumstances. Helen, for example, is drawn with lots of shading and I think this represents how alone she feels and the way she lives in shadows, much like Jane Eyre did. She too was dark and plain, and the ability to showcase this through the artwork without having to use words to describe it and her feelings highlights Helen’s loneliness and longing to fit in.I was pleased to see that the author did not focus too heavily on the love story, but rather Jane’s personal strength and growth, so that the Helene’s growth could be for herself and not to please others, particularly romantic interests (which I think is a tad overdone in kids books). I especially like the portraits Helene drew of herself in contrast to Jane as a coping mechanism to remind her not to spend too much time on wishful thinking. She drew herself much more plain than she is, and I think many young girls would be inclined to see themselves in a similar way. The second contrast was the nature. Helene spent many of the panels and pages outside and there was a focus on the potted plants throughout the very urbanized city. Like Helene, they are not natural to the environment, but they persist and grow beautifully, much like Helene herself. The contrast of pencil and watercolour was quite beautiful and a stark contrast to the pen and ink that Helen was rendered in. The use of splash pages showcase Jane’s own feelings, and the subtext of the plants, both potted and natural, growing beautifully amidst the concrete of the world around them, mirror Helene’s own struggle to grow and accept beauty. Social discourse is apparent through the book. Bullying is the main theme. There was a nice dichotomy between the way peers perceived Helene and the way she classified and labelled others. She, though the victim, was still prone to dole out verbal accusations and bullying, even if she kept it to herself. The addition of her friend at the end was nice and a happy resolution to the story, but I was a little concerned that the end message could be interpreted as “self worth can be found in having even just one friend” when, and this is just my opinion, a stronger message would be in the notion that self worth comes from making peace with yourself and in so doing friends will follow…. But that is the beauty of literature, interpretations are many!! Overall, I would love to use this book with my students. I will read it again. It was quite lovely. I like to write and I have been struggling to write a novel for sometime. Every time I sit down to write my mind goes blank and then, inevitably, I let my negativity get the better of me and I just give up all together. 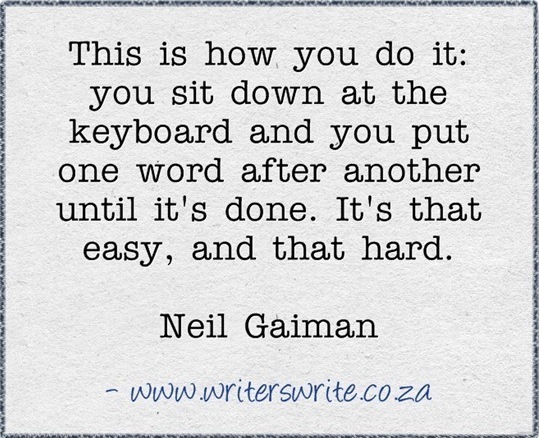 Gaiman’s quote confirmed what I had always known; I just had to write. Practice makes perfect, after all. But what would I write? My best friend has a blog. She blogs about life and parenting. It is inspiring to read her personal journey. It is important. I wished I had something worthwhile, and maybe life affirming to write about. Being unfamiliar with the blogosphere, that is what I thought bloggers did. Write about really important stuff. I didn’t think I had anything important to say. Then one day I decided I did. It all started when I realized that I followed more comic news sites on my Facebook than I followed actual people. It occurred to me that most of those sites were blogs. I was following blogs! I was reading blogs! And I realized that blogging could be about things I love. But I also realized none of these blogs were exploring and sharing what I wanted to read about- not comics, movie tie-ins and new releases- but how comic culture intrinsically affects a reader. As I searched for similar sites there was very little to satiate my curiosity, so I decided I would write the kind of articles I wanted to read. and how to attract a readership I had to learn to navigate this world. “Tags”, “Buzzwords”, “Followers” were foreign concepts. For me, computers are largely for word documents, email and academic research. I don’t surf the web, so I had no idea where to begin. My best friend suggested I check out WordPress.com. When I searched the site I was overwhelmed by the plethora of options available to me: backdrops, packages, free vs. fee service, hosting, and themes. I didn’t understand half of the jargon. So I took a step back and googled, “How to start a blog”. There are an infinite number of articles out there explaining how to run a blog. I was looking for information that would help me as a newcomer, someone who wanted to blog for enjoyment, not to make a business of it. I wanted to know how to choose themes, how to use tags, the importance of catchy titles, and why people love blogging. I was disappointed and overwhelmed by the sheer number resources devoted to making a profit from blogging. I found the pressure heavy and it took enjoyment out of the process. I had to learn to distinguish between honest resources to help newcomers find their footing as writers from the bottom line sites that were leading me back to negative writing experiences. Some of the most informative resources I stumbled upon were comic sites, Ted Talks (there are great talks about why people blog and the catharsis that comes from sharing personal stories), local newspapers (which link to blogger sites and are distinctive in their voices), and other blogs (The Minimalists, in particular, offer a comprehensive checklist for starting a blog). Because blogging is such a personal endeavour, the information I found most helpful was the information that made me feel good, informed and curious. I also I reached out and asked people I knew for advice. Common among their encouragements were to “write as often as you can! But it is hard to keep up with blogging with the busyness of life, so if you don’t get popular fast, no worries!”; and “make your site interesting to look at; use lots of images; write about what you want to write, and not what you think other people want to read”. All of my research encouraged my desire to blog; however, it was the constant brainstorming with my best friend that propelled me into it. So we decided to launch a blog together. We spent weeks sending each other links to blogs that we liked and admired as examples for what we might want to include in our own. We searched the Internet for blogs, Facebook for links, and local community newspapers for “life” writers. We wanted to learn about voice and style, what readers engage with and what doesn’t work; the more colloquial a blog, the better! We learned about linking to Twitter and Facebook. And along the way I observed that I learn best when guided by a mentor. We bought a domain name through WordPress and settled on a theme. Then we decided to dedicate our website to life, art, culture, and parenting, each its own tab for its own collection of posts. We named it The Feminine Pulse. We also invited other women to contribute to our blog, intent on building a community. Blogging quickly became more than a place to contemplate geekery. I realized that I could navigate the Internet and use the people around me as resources and experts. I learned to differentiate between good blogs and bad ones, what strengthens them and how powerful they can be. I am also not as scared as I used to be about utilizing the Web and contributing to it. I am excited by gaining followers and equally by following others. My first blog post is titled, “How Comics Saved My Life”. Comics may have saved me, but blogging has given me a writer’s purpose. You snuck out of bed before the sun broke through the morning sky. You crept into the bedrooms and kissed our kids goodbye. You held me tight one last time before your long journey began. While you check your luggage, we are waking up. I am given kisses and morning snuggles. I know you are trying not to be annoyed by the lineup at security. By the time we eat breakfast, read and reread Hand, Hand, Fingers, Thumb, and build a farm on Minecraft, you are closing your eyes thirty thousand feet above us, never drifting off to sleep because you are thinking too much again. You should stop twirling your hair. Rest while you can. Your first connection is at lunch time. You eat hurriedly at a bustling restaurant where too many voices in too many languages make it hard to concentrate. You want to call to say “Hi,” but the noise is overwhelming, so you text me instead. We are blowing bubbles in the backyard. The serenity is overwhelming. have been all day, the worry returns and I pretend you are reassuring me from above the Pacific. It is already tomorrow where you are. We are no longer in sync, and I know that when I do hear from you it will be a brief phone call in the seconds before you catch some rest, readying yourself for the last leg of your travels. Another lonely midnight flight as the sun breaks through my morning window and I am showered with a toddler’s snuggles once again. I am ashamed that I am lonely, even though I have these little arms to wrap around my neck; that I fleetingly begrudge your descent into Europe; that I envy the way your career is taking off. I breathe like you always tell me to. And I realize none of that is true. I am not lonely, I am lonely for you. Your Europe of metal and oil is a harsh antithesis to my Europe of art and culture. Your career is what allows me be the best mommy I can be. The best daddy I can be, too. My turn will come, whenever I am ready, you will see to that when I start to worry and waiver. I have no cause to be lonesome. I am not cramped in a small seat for hours at a time surrounded by a culture to which I do not belong. I am not on the other side of the world away from the people I love (the food I love, too!). 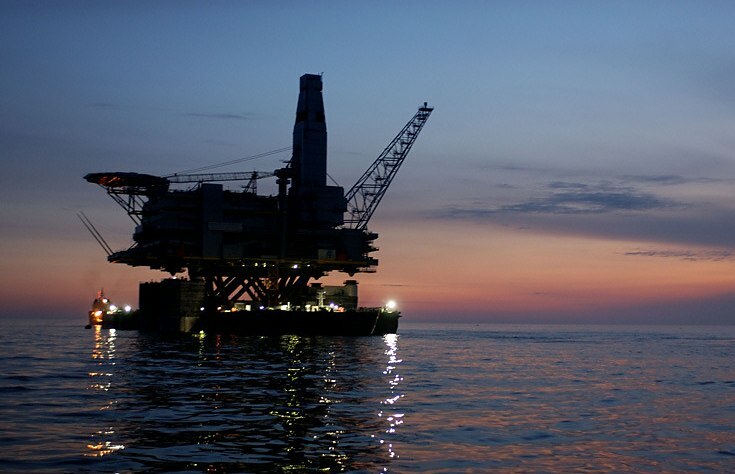 I am not bounced from shop to rig, sleeping in hard bunks to the hum of twelve men’s snores. I am not alone on a massive tin can straddling the currents in the middle of a sea. But I am lonely for you, and no matter how many miles are mapped out between us we are still in sync; even if you are in the future of the meridian and I am still in the past. In a month you will travel back in time to be with me again. Eventually will you fly once more. Thirteen new hours (and then some) in the sky while we go to school, the rink and the pool, clutch snowmen stuffies, celebrate milestones, blog, and cuddle. In 38 days you will creep through the darkness of our sleeping home, you will brush their cheeks with a kiss, then crawl into bed, wrap your arms around me and say, “Hey, Baby”. You will be home again. The graphic novel, Beast, by Marian Churchland, was laying precariously on the adult comic shelf at my local library. Someone had obviously picked it up, flipped through it, then discarded it lazily atop a collection of Superman books. I stumbled upon it while I searched for a handful of titles I hadn’t yet read. Lucky for me someone decided it wasn’t the book for them. 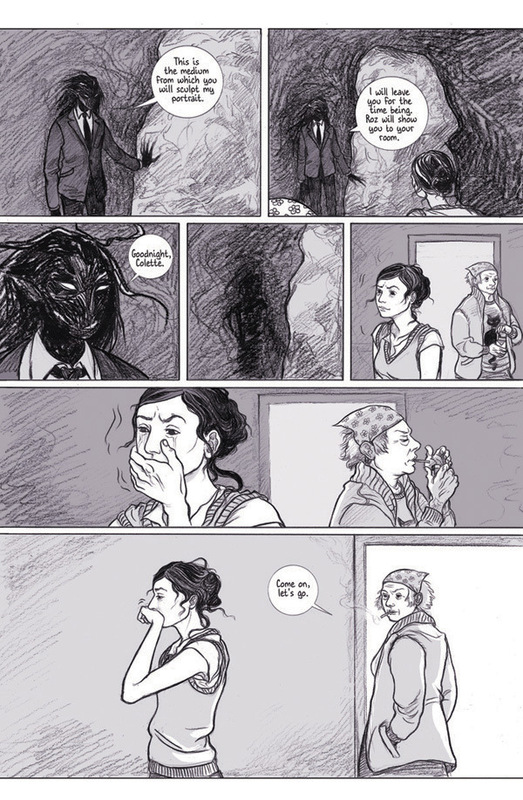 Beast is one of the most beautifully drawn books I have ever read. From the initial image of Colette, the protagonist, sitting contemplatively on a wooden chair I was irrevocably invested in the story. I almost felt like I was looking at myself on the cover of a novel: tattered jeans, dull tank top, messy up-do, bare feet, and deep penetrating and pensive eyes. Before the story began I was engaged. Beast is a Canadian interpretation of the fairy tale Beauty and the Best. But it is not a fairy tale at all, not in the contemporary understanding of the genre anyway. Colette is an artist commissioned to carve the likeness of a shadowy figure (both metaphorical and literal) out of a block of marble. The density of the alabaster and the unease of willing captivity are in direct contrast to the genteel and ethereal, Beast, who captivates an inquisitive Colette with an ancient and mysterious tale. Beast does not end with a prince saving the day, nor is Colette a princess in any way. Instead, Beast is a tale that inspires commitment and perseverance of finding one’s place in the world, while inciting the notion of unconventional love. Churchland’s art is delicate and real. from tiny details such as the tag sticking out of the back of Colette’s shirt, to capturing the chaos and intrinsic essence of Beast with undetermined form and a sensible disorder of wisps and blackness. 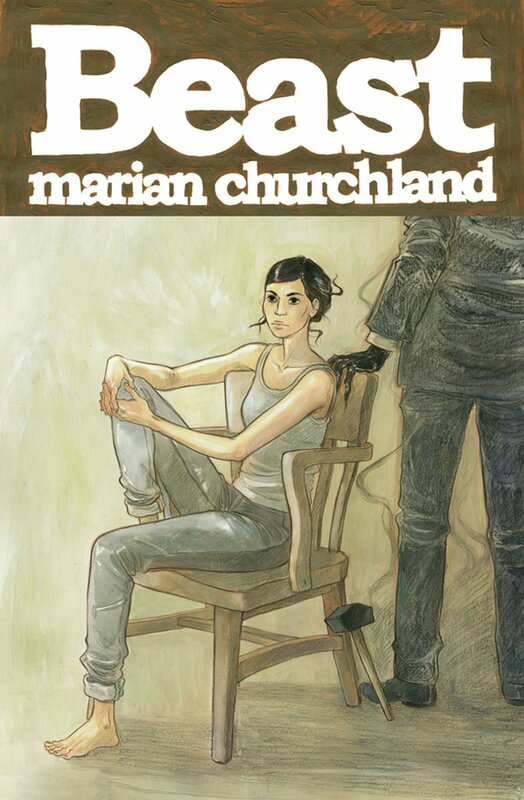 Unlike many graphic novels, where characters are indistinguishable, each of Churchland’s cast are unique and deeply considered. So too is the setting: a once grand neighbourhood and house collapsing and decaying with time and neglect; much like the shadowy figure who dwells within. In the auspicious decision of a stranger to cast-off this novel for another, I found a retelling of a favourite tale, and was introduced to an artist for whom I have great esteem. Much like Beast himself, cast aside and forgotten, this novel was waiting for a true believer to pick it up. How will I ever return it? Books about Nova Scotia are abundant. Books about small distinct Nova Scotian communities are not. Up Home, written by Shauntay Grant with illustrations by Susan Tooke, is a love song about growing up in North Preston, a small community on the outskirts of Halifax, the province’s capital. Grant is a spoken word poet and laureate. She has presented her history as a member of North Preston’s community with the rhythm and dialect of her family and peers. She has given us, outsiders, a rare glimpse into the secret and intimate life of a North Preston child. Living joyfully, treasuring kinship, running freely, and loving abundantly. 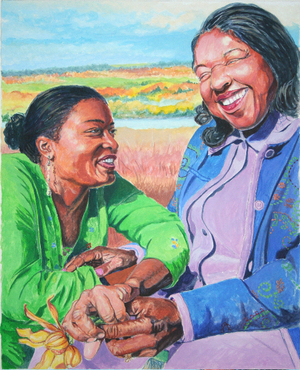 Susan Tooke’s art captures the soul and vibrancy of the faces of North Preston’s community. Each member is unique and expressive, an ardent representation of a neighbourhood fuelled by fondness and pride. I am lucky to have been given this glimpse into a world so close to my own, but from which I am so far removed. I share it with my children as we snuggle in bed and I share it with my students when we contemplate the individuals who make up the patchwork of Nova Scotia’s identity. This is a beautiful poem for family and love. A touching memory of a real community. I’m not giving up on you, I just feel like it may be a good idea to see other hot beverages as well. Maybe this running into each other numerous times a day could be pared back to once? You have done so much for me in this sleepy phase of my life, where I continually run on steam and lack of sleep. You have brought me comfort in the chaos of children, stress relief at work, quiet moments to myself… but I have met exercise, who has promised me much more energy and feeling more alert in general. While also bringing me some piece of mind and time alone. I promise I will still see you once a day, and I will look forward to that moment all day. I just have to stop relying on you to wake me up in the morning and keep me going all day. Or even evening sometimes. I still adore you, I swear it’s not you, it’s me. I thought I’d left Jem and the Holograms back in the 80’s with my earliest memories: Synergy drawn on a child sized blackboard, un-erased for months as I commanded my own “showtime”; an image of Jem drawn on the bottom of my first skateboard, instilling me with a chic confidence; my favourite barbies, Holograms and Misfits alike (I had each and every one); ingesting spoonfuls of Kraft Dinner, unblinking, as the battle of the bands commences at noon. Jem was a staple of my youth. Now it has become a staple of my adulthood, too. IDW Publishing has brought back Jem and the Holograms and transformed a much beloved childhood pastime into something truly, truly, truly outrageous: an ongoing comic series. Truthfully, I was sceptical about the re-emergence of Jem. I really was (have you seen the film trailer? Gah!). I mean, for everything that was awesome about the cartoon, there was so much inherently wrong with it. Watching now as an adult (Yes, I still watch Jem as a thirty something woman! ), I can assess the ways in which it negatively influenced and impacted the way I would grow to interpret the world around me. Throngs of young women were growing up learning that professional women were a force to be reckoned with, thanks to the way Jerrica took on Starlight music, but we were confused about honesty and integrity. Although women were central to the show and “girl power” was apparent, love was often the central theme; but in love, women were still expected to be subversive. Romantic love became convoluted as Rio and his expectations of honesty from Jerrica were in direct conflict with his own actions as simultaneous lover to both Jerrica and Jem. Likewise, Kimber was always juggling boyfriends with disregard for their feelings. This did not escape the considerations of a young child familiar with divorce and the fall-out of love affairs. Perhaps most jarring, was the notion of hiding who you are. Successful, stunning, award winning, extroverted Jem is not a real person, rather an incarnation of quiet, contemplative, and conservative Jerrica who shone brighter and more confidently when she was the antithesis of herself. A rub of a pair of ruby red earrings and the mantra, “Showtime, Synergy” downplays the tumult of a hardworking and earnest woman in a male dominated society. That said there are days when I would love to have my own life altering jewellery and catch phrase, too. Most disappointing, I think, when I look back on my favourite childhood show, was the inadequacy of ethnic representation and cultural diversity. For a show about the fortitude and power of women, there was little variety. All the girls were tall, lean, buxom, and stunning. When I swapped outfit and a wig on my dolls, any one of them could have been any other one. Sure, the show dabbled in ethnicity, but an honest consideration of the characters concludes a Eurocentric homogenized cast. There wasn’t enough for those of us watching at home, living outside of the mould, to hold on to. Thank goodness for the creative team at IDW. From month to month, the printed single issues present a plot that is sound, vibrant art, quick dialogue, and a story arc that is exciting and engaging. And yes, I know, the original Jem had these features, too; but what the comic accomplishes that the show did not is an ability to appeal to the masses- thirty year old die-hards like myself, and new and transitory young audiences. I love that in this new Jem, each character is distinctive. There is no physical mould to fit into. Some, like Kimber and Jerrica are slender, others, like Aja and Shana are curvaceous. Some are tall, others are short. Not one girl looks like another. None could be swapped out or confused for anyone else. And I can see myself in these characters. From lovelorn Kimber, to anxious Jerrica, to shapely Shana, to inquisitive Rio (who, I might add, is so far committed to Jerrica and somewhat distrustful of Jem. How great for a guy to choose a girl for her personality, not her looks! Already, this Rio has put past Rio to shame!). I am also a fan of the way IDW are shinning a light on Jerrica’s debilitating anxiety. Anxiety is far more than public speaking (or in this case, singing), but is often over looked, ignored. By giving the central character a crippling mental struggle (whether or not this is something they attest to), I think many more fans will embrace the story and see themselves reflected in it. Perhaps the best part of the whole relaunch, however, is the inclusion and representation of diversity. Ethnicity, so far, is given credence by visual honesty as characters are drawn as their reader counterparts might see themselves in their mirrors at home. We are not, any of us, exactly alike. Why should each pop cultural icon (cartoon or not)be expected to be interpreted the same way? 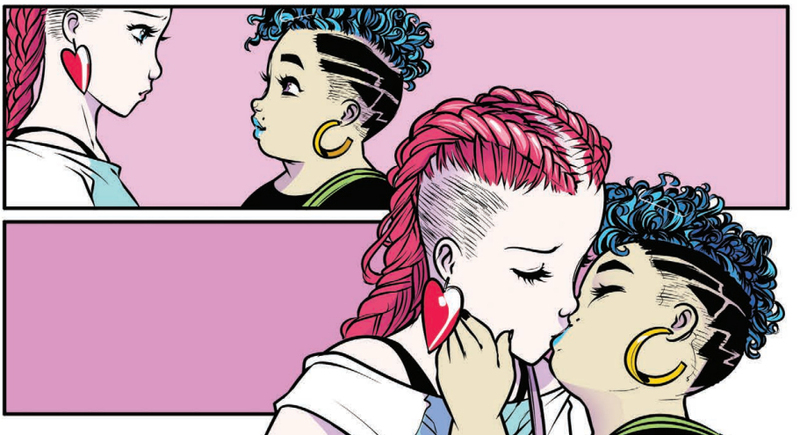 Like ethnic diversity, the new Jem and the Holograms comic also promotes sexual diversity, sexual orientation and healthy sexuality. Kimber and Stormer, oft freinds and foes of the past, are now more than music partners. They are partners in love! It is so wonderful to see positive and excited depictions of members of the LGBT community in mainstream media. Bravo, IDW team! We need more of this positive messaging in our contemporary media! Already, only five issues in, the new Jem series from IDW has brought anxiety, body consciousness, honesty, healthy relationships, and LGBT themes to the table. In five issues they have introduced more contentious ideals (as subtle and natural facets of life) than the television show was able to do in three seasons. Finally, this is a Jem we can reflect on confidently. One this older generation fan can proudly share with her daughter. It is a wonderful notion that a powerful influence on my childhood is newly informing my adulthood, and is there for my daughter’s youthful judgement as soon as she is ready. 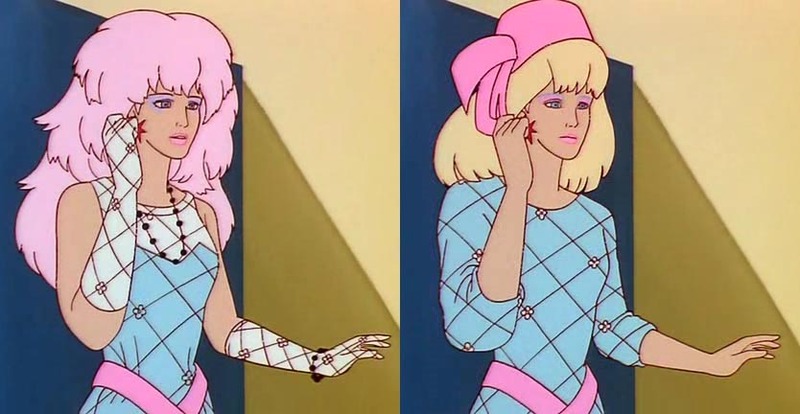 Jem and the Holograms is 80’s pop culture cannon. I will always love it, but I do not love everything about it. For all its appeal, it has its faults, and IDW is showing us all that Jem is much more than “glamour and glitter, fashion and fame”. I don’t worry that this new Jem and the Holograms won’t be as good as the old. I already know it’s better. I have a crush on Archie Andrews. That’s not a sentence I thought I would ever say. But there it is, for the world to see. And yes, I mean that Archie Andrews. Archie. The redheaded, commitment-phobe, serial dater and jalopy driver. The kid who was always blundering about Riverdale like he owned the world, despite his penchant for being perpetually in debt. Growing up I was a huge fan of Archie comics. I liked the stock characters, the predictability, the wholesome town, the fashion pin-ups. I could never decide if I identified more with the loveable and reliable friend Betty, or the selfish and conniving (yet good hearted) Veronica. I always wondered what the appeal was for these striking girls who were so in love with the humdrummery that is Archie Andrews. And more than that, I was perpetually flabbergasted by his ineptitude for healthy relationships. I mean, Dude, pick a girl already! As I matured, the comics did too. The last decade saw a tremendous shift from the cartoonish short stories about Riverdale shenanigans, to sophisticated and contemplative narratives. My generation of Archie fans was consumed by the soap opera that was Archie: The Married Life, where a walk down Memory Lane gave readers a glimpse into the life he wo uld lead should he choose either Betty or Veronica. This culminated with the tender and retrospective Death of Archie. Later, Afterlife With Archie would rock my post apocalyptic sensibilities with a zombie takeover. But the real deal, the really great reading and visual experience of my life with Archie Andrews is only just beginning. The first Archie #1 issue in 75 years has hit the shelves this past week. Written by the incomparable Mark Waid (Daredevil) and illustrated by the game changing Fiona Staples (Saga), Archie is no longer just a fun, cartoonish blip in a larger reading experience. Archie is finally a guy I can relate to. A guy I can admire. A guy I want to get to know. I guy I could totally crush on if I was a comic character, too. 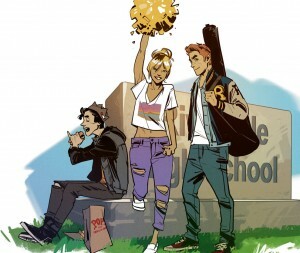 Waid brings us to Riverdale in the middle of high school. Archie greets his readers and invites us into his world with an intimacy never before experienced in an Archie comic. Archie looks cool, too. The bowties are gone and he looks just like an ordinary North American teenager, thanks to Staples’ realism. Also, he’s been dating Betty Cooper since the fifth grade. That’s right ladies, Archie learned to commit and Betty Cooper was his first true love. It’s on the record, it’s part of canon now, and it’s ABOUT TIME! Jughead, Dilton, Kevin Keller, and Reggie make appearances, satiating the reader’s hunger for the old Riverdale crew we grew up with, but the cast is much more ethnically diverse, a long overdue necessity underserved in the Archie canon. But perhaps the most interesting plot twist is that Veronica Lodge hasn’t been introduced yet. Instead of picking up a comic long in the midst of a love triangle, this first issue gives Betty a chance to be missed, to be longed for, before the buxom brunette enters the scene. Archie, at long last, is the character we have been waiting for. The guy next door we can relate to- and want to relate to. Mark Waid and Fiona Staples are giving Archie lovers an icon to admire and a story to sink our collective teeth into. That’s why I have a crush on Archie Andrews. He is finally the guy he was supposed to be all along. Considerate, humble, devoted and mature. He not only commits, but he loves fully in the process. He handles losing love with reflection and introspection. His friends see it too. And maybe Ronnie will throw us all for a loop, but the damage has been done. Archie is a good guy, better than I have ever known him to be. I won’t unsee that now. 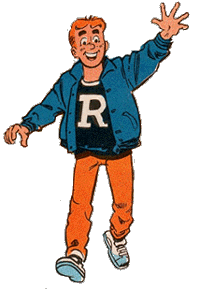 And if readers can have literary crushes, than Archie Andrews is mine. And I am crushing hard.